Enjoy playing cards? In Scarab 21 you get to do just that! In this game you will have five columns and you must play your cards making sum 21, which is why this game is called Scarab 21! 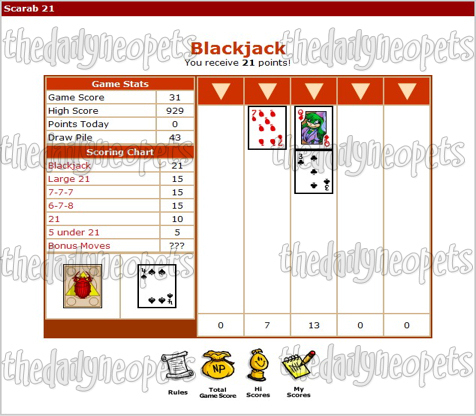 Scarab 21 is based off of the common card game called Blackjack. Each game played costs 50 Neopoints to play and you are only allowed to earn 5000 Neopoints a day. This game is played using your mouse, pretty simple! 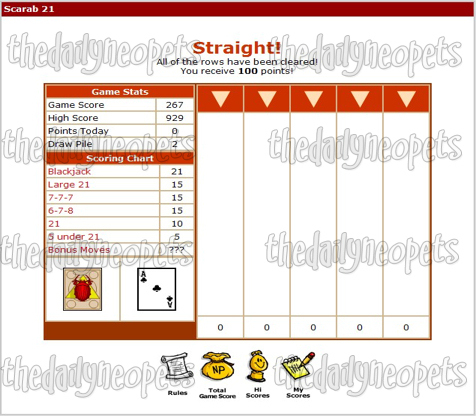 Starting out you will have five empty columns and a stack of cards on your screen. The card values are pretty simple too. All number cards, 2 through 10 are worth their face value. Kings, Queens, and Jacks are worth ten points. An Ace is worth either 1 point or 11 points, this depends on the other cards in your column. If you reach a point where you cannot play any more cards, the game will simply end for you with "Collect Points" at the top of your screen. Your first card is shown on the left side of your game. 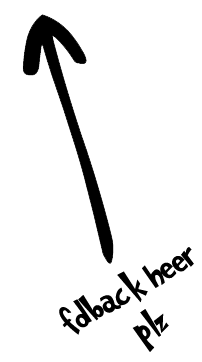 To place the card in a column you simply click the arrow at the top of that column. Once you reach a sum of 21 points that column will disappear and you will have a message above your game box telling you which combination you completed and how many points you received. Above the section where your current card to play is, you will find the scoring chart and game stats. 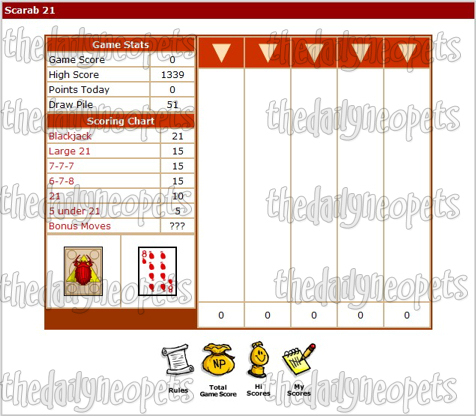 The game stats simply cover your current score, your high score for the game, how many points you have earned today, and how many cards are left in your draw pile. The scoring chart shows you the points for each combination you can complete. Blackjack will give you 21 points. To play a Blackjack you will need a King, Queen, Jack, or a ten plus an Ace. Playing a Large 21 will give you 15 points. A Large 21 is four or five cards that make a sum of 21. Next is the 7-7-7, which gives you 15 points. This is pretty simple really, to get this combination you will need to play three 7's. The 6-7-8 is also worth 15 points, you need a 6, a 7, and an 8 to achieve this combination. The next one worth 10 points is the 21 combination, this is just a regular combination that doesn't fall under any of the other combinations. 5 under 21 is worth 5 points, and is achieved when you have 5 cards that equal 20 points or less. Last but certainly not least is your bonus moves. Each bonus move awards you a different amount of points. Playing the bonus combinations will give you more points. Take time when playing to plan for bonuses. Try to avoid placing cards worth ten points together. The only way to clear those columns is by getting an Ace and they are not that common, after all a deck only has four Aces! If you have too many points in all of your columns you are bound to lose the game. Cards worth ten points occur more often than any other, since they account for more cards. So be careful where you place them. As with every game you have ever played, practice makes perfect. 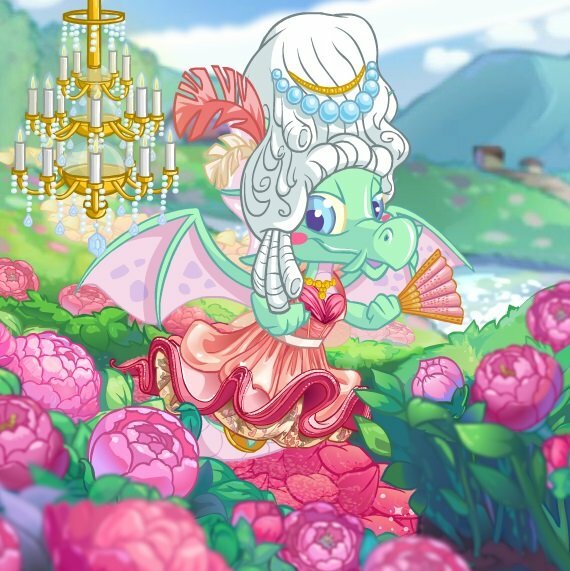 Just remember to watch where you are placing your cards and aim for those bonuses! It's a really simple game once you figure it out. Now head on over to play Scarab 21! The Snowager is awake. He'll be sleeping in 2 hours, 58 minutes.